Taumarunui Golf Club has a friendly atmosphere and warmly welcomes new members. The Tarrangower course is a quality layout and all weather course, well regarded and enjoyed by visitors and local golfers. This tree-lined and open parkland course contains a variety of attractive holes and pleasant features which provide a great test of golf. 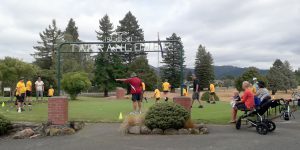 The Taumarunui Golf Club is a popular venue for a range of events such as weddings, corporate and client functions, staff functions, reunions etc. Thirty seven keen golfers faced the starter for the second round of the Tarrangower Shield and the first round of the Consolation. Once again the weather was perfect for golf and even though the greens had just been cored it didn’t seem to matter as there were ten 2s, which is the most this year by a country mile. Best individual score of the day was shared by Noel Lawson and young Shaam Bhullar with 40 points. Thanks to the enthusiasm of Roy Frampton and volunteer club members, the new Junior Golf Academy for local primary school students got underway recently.